The thought of leaving your children alone with a stranger is particularly difficult one to come to terms with, yet many of us need to do it. The best way to become comfortable with a new nanny is to interview her extensively, ask for testimonials, call her references, check out her Facebook page or Linkedin profile and Google her name. A short, but focused interview will tell you a lot, but you need to ask some targeted questions. I have compiled a list of what could be described as behavioural questions below. As she gives her answer, try to gauge how good the candidate is at communication, how does she manage her time, her job duties and the various demands of looking after a child? Then determine if it fits into what you are looking for in an employee working with your children. About once a week, or perhaps every ten days or so, we get a decidedly suspicious entry as a family profile in the Find a Nanny website. When we see something we are not entirely happy with, we do some digging. Recently, within a few days of each other, we had two entries that raised a "slightly reddish" flag. More of a pink one, actually. We checked out the Singapore postal codes and noted the Singapore phone numbers they had supplied, but it was something about the unusual grammar and the insistence that the nanny be willing to travel, that made the flag flutter a little. We did an IP Address search and sure enough, each submission came from slightly different locations in Lagos, Nigeria. Internet cafés, most likely. Needless to say we immediately deleted the entries and their accounts with Find a Nanny. One slightly worrying fact is, that for a few hours, they would have had the contact details of all the nannies on the site, so there is a possibility that they may try to contact one of "our" nannies (the word "our" not being used in the possessive sense, but in the "we feel responsible" sense). Find a Nanny is - by any measure - way ahead of other Internet job posting sites, most of which display phone numbers, email address and even postal addresses to the Wide Wild World. I think it may be time to move to the paid listing model for families. A scammer is not going to pay to promote his grubby little scheme. His credit card number would never make it through the PayPal screening process, anyway. And if a family is not prepared to spend a few cents a day to find the best nanny, well so be it. Male with a very important position in a big company and is very busy. Works in the "City" or "CITY", note the capitalisation. Often claims to be in London. Wife has just died tragically. You will be looking after a beautiful little girl/boy. Your own room with hi-fi and TV. No housework, or very little. They already have a maid, you will only have nanny or babysitting duties to fulfil. There is a driver, or alternatively, you will have a car to drive around in. How does the scam work? There are many variations, but if you reply to the advertisement you will get the job very easily. Surprisingly easily in fact. They won't even bother much with references. You may get an employment letter from "Sir's" lawyer (Sir is very busy and is currently overseas). You may receive a cheque for a large sum of money as a salary advance. Some of that money is for Sir's local agent, so please bank in the cheque and write out another cheque for a lesser amount of money and post it, or hand it, to Sir's local agent. Or everything is in order but there is a slight hitch with the visa processing, and because Sir is overseas, Sir's lawyer requests you send some funds to cover the expenses. Don't worry, you will be reimbursed. And endless variations on that theme. Needless to say Sir's cheque is a dud. There is also the inverse situation, where an excellent nanny has been found by a genuine family, she even looks like a perfect nanny in the photograph. She is well educated, lots of experience, adores children has superb testimonials, but at the last minute there is a problem with the travel arrangements and could she have just a small salary advance to help her to solve the problem. So do be careful when making arrangements involving money. That's why we insist that all of the nannies on Find a Nanny are residing in Singapore. There are a few exceptions. Confinement nannies often live in Johor Baru, and occasionally a nanny has planned to move here and is hoping to have a job ready for her when she arrives. 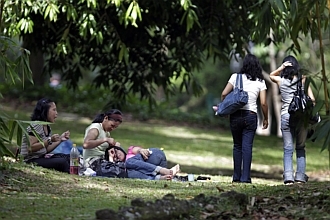 All employers will soon have to give a weekly rest day for maids, under a new law that the Government plans to introduce from 2013. The legislated rest day, said Minister of State for Manpower Tan Chuan-Jin in Parliament on Monday, will apply to maids whose work permits are issued or renewed from Jan 1 2013. New employers who hire a maid for the first time from Jan 1 2013, will also be subject to the new rules. For existing maids, the new regulation will not apply for the remainder of their work permit. Mr Tan added it will give maids a 'much needed emotional and mental break from work and time apart from their employers'. Activists have long pushed for the mandatory day off, but many employers worry about the impact on their care arrangements at home. Mr Tan said there will be flexibility in the new rule, if both parties agree on arrangements. Some Quick Tips on How to Hire a Maid, Nanny or Babysitter. It's best to get organised before launching into the process of selecting a maid, nanny or babysitter. Here are some tips to think about. Firstly you should spend some time identifying your needs, and get them clear in your own mind. It's easy to come to the conclusion that you need help around the home, and then advertise for a maid, nanny or babysitter, with only a hazy idea of what that person would do for you. Write down in a list what you need help with. Do you want a nanny to live-in, or live-out? What tasks will your nanny have to do? What hours will you want her to work? How many days off? Full time or part time? Who will she report to? You exclusively or you, your spouse and your mother-in-law? Will there be travelling involved? What will be her roles and responsibilities? Baby care, toddler care and or childcare? What activities? House keeping? laundry, cooking, serving meals, driving, swimming, badninton, walking, shopping, gardening, time at the playground? What kind of financial arrangement? Salary, hourly rate or daily rate? Can you offer you maid, nanny or babysitter any other benefits such as performance bonuses? This process is crucial to obtaining the best maid or nanny. It is a bit different from interviewing candidates in the corporate world, for in addition to ensuring that the nanny's skill sets satisfy your needs, it is also very important that you feel comfortable with your new nanny, maid or babysitter, because they will be spending a great deal of time in your home. Please do a face-to-face interview to try to learn as much as you can about her. Review her work experience, and responsibilites at their previous position. What did this nanny like and dislike about the families she work with before? What was their previous salary, and very importantly, what were her reasons for leaving. Try also to find out her long-term goals and time commitments. If you think that a particular nanny might satisfy your needs, it is at that point in the interview that you can explain the roles and responsibilities of the position you are offering, and explain what your your expectations are as an employer. If you feel that you have made a connextion with a particular candidate, and she might be the nanny or maid for you, it is important that you ask her for her references and telephone them. Once you have verified that the references are valid, the next step would be to do a second interview and then introduce the nanny to the other family members. After you have interviewed, selected and screened the candidates for employment the next step to securing this person is making an offer. Most household employers prefer a Terms of Employment letter, or a guide as opposed to a contract. A guide is helpful in several ways. There often are so many responsibilities for the typical nanny's job, it may be difficult to list them all. So a Terms of Employment letter creates a new way to communicate with your new employee. You can discuss this guide on a weekly, monthly or quarterly basis, eliciting their thoughts and observations about their job. It also gives you an opportunity to constructively appraise your nanny in a non-threatening way. Remember communication is paramount. Your guide should also include compensation or any additional salary for overtime or extra tasks not originally discussed. It is important to describe the compensation you are offering. Salry overtime, days off, vacation, sick days, public holidays, talk about everything including the start date.